This one is basically what it says on the box; it’s just a digital ruler that you can whip out of your pocket any time you feel a pressing urge to measure things. It also comes with a protractor and level. As a concept, I like this, since I only own one ruler, and I misplace it on a fairly regular basis, but in practice, I’m not quite as wild, partly because it seems too short to be very useful on the iPhone screen. The app only displays a static image of a ruler on the screen, approximately 6 centimeters or 2 and a half inches, which is just…not very big. I imagine it fares better on the iPad, but on the iPhone, you’re stuck measuring items 6 cm at a time. Additionally, I can’t tell if my ruler and tape measure are just lousy, but it looks like the measurements might be off slightly. 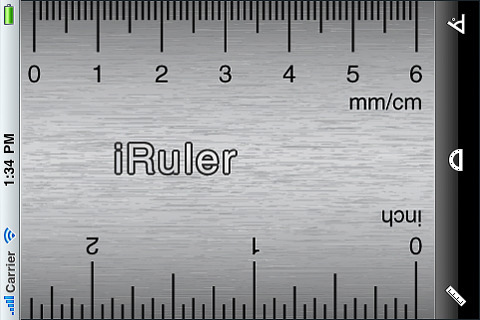 That said, even if iRuler is 100% correct and my cheap plastic ruler is wrong (very likely), it’s still very difficult to get an accurate measurement of any object by holding it up to the iPhone because of the border around the screen. For getting a general estimate, iRuler is perfectly fine, but it’s not so good for anything that requires precision. The protractor is even worse for taking measurements, because then you’re left trying to eyeball the lines awkwardly, resulting in hazy guesses at best. Moving around the little pivot arm in the middle is smooth enough, but again, the performance of the device on screen is useless if you can’t get a good measurement off screen. The level is marginally more useful, although given how much calibration most tilt control games require, its accuracy should be taken with a boulder of salt. You have a choice between laying the phone on its back or holding it up on its side. On its side seems fairly silly, if not downright dangerous, since the edge of an iPhone is not the most stable resting point in the world, and the last thing you want is for the phone to fall over and break, but laying the phone on its back is reasonable enough. Unfortunately, there’s no place in the app to jot down any measurements, which means this is a really stripped down set of tools. Visually, it has a nice, clean, and easy to use interface, all brushed steel and minimal buttons to fuss with, but it’s about as basic as you can get, and you’re not really getting much other than a useless protractor, a basic level, and a picture of a ruler. If it were a free ad-based app, I could see myself getting it for “just in case”, but paying for it when I could eyeball the measurement about as well just seems silly. 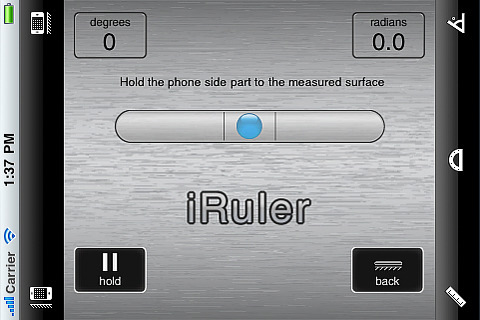 AppSafari review of iRuler Pro was written by Tracy Yonemoto on October 25th, 2010 and categorized under App Store, Developers, Homes, Productivity, Utilities. Page viewed 7296 times, 1 so far today. Need help on using these apps? Please read the Help Page.